Located in the modest arid village of Alsisar, 23 kilometers/14 miles from the district headquarters of Jhuhjhunu in Rajasthan, the heritage rich Alsisar Mahal palace is an oasis sitting luminously among the battle-hardened desert surroundings. Claimed in 1737 by the ancestors of current heir Thaukur Gaj Singhji, the brilliant Alsisar Mahal is the most recent addition to the Alsisar Group of Hotels. The Group is known to feature ideal properties for experiencing the regal history of India. The magnificent architecture and the mesmerizing interiors, including antique furniture, intricately carved poster beds, and delicate Rajasthani motifs, create a luxurious ambiance fit for royalty. Alsisar Mahal is a spectacular retreat featuring splendid views over the village boasting beautifully appointed suites, a darbar hall converted into a modern fine dining establishment, and enchanting lawns and pool. The expansive serene courtyards and gardens lend a distinctive character to transport guests into the romance and grandeur of its dignified era. 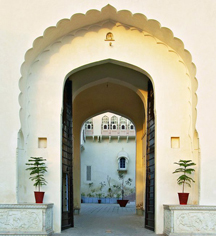 Alsisar Mahal, a charter member of Historic Hotels Worldwide since 2012, dates back to the 18th century. The heritage rich Alsisar Mahal was once the residence of the Thakur, feudal lord of Alsisar. 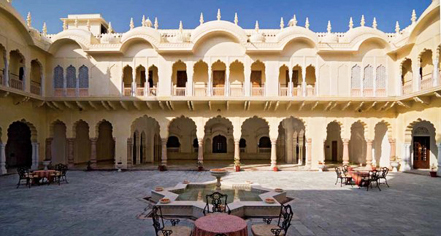 Located in the modest arid village of Alsisar, 23 kilometers/14 miles from the district headquarters of Jhuhjhunu in Rajasthan, the heritage rich Alsisar Mahal palace is an oasis sitting luminously among the battle-hardened desert surroundings. Learn more about the History of Alsisar Mahal .